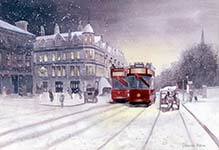 London Trams in snow - watercolour painting Brixton Hill, London. Cable Tram c1890. A watercolour painting of London Trams in snow.